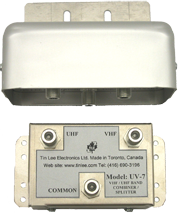 MT-50/75 is designed to impedance match a 75ohm device, such as RF filter or amplifier, to a 50ohm system. 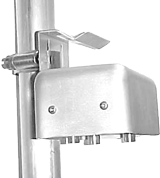 This prevents mismatch and signal reflection. It is a cost-efficient solution to convert a 75ohm signal for a 50ohm measurement, or vice versa, for measurement or transformation purposes. It does this with good return loss to improve measurement accuracy. A further advantage of this matching transformer is that it features a low through loss, preserving much more of your input signal than a matching pad (6 dB) would. Provides >40 dB rejection DC-40 MHz, 250 to 430 MHz; and 770 MHz to 1000 MHz. High quality TV antenna preamplifiers, designed to optimize the TV/FM signal reception from the TV antenna to the TV or Headend by providing a stronger signal with improved signal quality. Band splitter/combiners are used to combine low and high frequency ranges into one output or used in reverse, to separate the TV/RF spectrum into low and high frequency ranges. Channel combiners are bandpass filter networks, consisting of individual bandpass filters joined together at one common port. Available for combining or separating up to 7 non-adjacent channels in one enclosure. Multiple units are used to combine large number of channels (e.g., 36 chs Headend). UHF/CATV (560 to 800 MHz) requires > 18 MHz frequency separation.